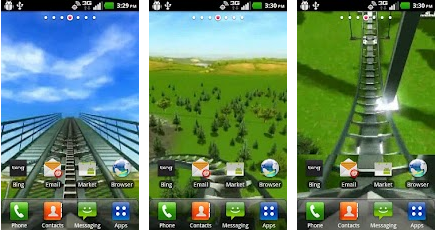 Soar down the tracks of a real-world rollercoaster topping 85 MPH every time you look at your phone! This live wallpaper is optimized to only run when you’re viewing your home screens or transparent app drawer, so it will not effect battery life! 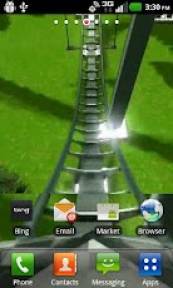 Jump on a soaring roller coaster every time you look at your phone! This live wallpaper is real life footage of a 80+ MPH roller coaster making tight turns and huge drops! After installing, long press on your home screen and set your wallpaper for Live Wallpaper. Some phones may be different, but navigating to Settings > Display (or Wallpaper) is where it will be with a preview as well! Works best on phones with Android 4.0 and above and looks great on the Galaxy S3! The wallpaper only runs when you’re looking at the home screens so it will NOT drain your battery.